This revised edition covers all aspects of public health informatics and discusses the creation and management of an information technology infrastructure that is essential in linking state and local organizations in their efforts to gather data for the surveillance and prevention. Public health officials will have to understand basic principles of information resource management in order to make the appropriate technology choices that will guide the future of their organizations. Public health continues to be at the forefront of modern medicine, given the importance of implementing a population-based health approach and to addressing chronic health conditions. This book provides informatics principles and examples of practice in a public health context. In doing so, it clarifies the ways in which newer information technologies will improve individual and community health status. This book's primary purpose is to consolidate key information and promote a strategic approach to information systems and development, making it a resource for use by faculty and students of public health, as well as the practicing public health professional. Chapter highlights include: The Governmental and Legislative Context of Informatics; Assessing the Value of Information Systems; Ethics, Information Technology, and Public Health; and Privacy, Confidentiality, and Security. Review questions are featured at the end of every chapter. Aside from its use for public health professionals, the book will be used by schools of public health, clinical and public health nurses and students, schools of social work, allied health, and environmental sciences. Illustrations note 43 Tables, black and white; 35 Illustrations, color; 79 Illustrations, black and white; XVIII, 666 p. 114 illus., 35 illus. in color. This totally revised edition of a classic textbook covers the context and background of public health informatics, explores the technology and science underlying the field, discusses new challenges and emerging solutions, reviews many key public health information systems, and includes practical, case-based studies to guide the reader through the topic. The editors have expanded the text into new areas that have become hugely important since the original edition due to changing technologies and needs in the field, as well as updating and augmenting many of the original core tenets. It contains learning objectives, overviews, and review questions to assist readers to engage with this vast topic. The Editors and their team of well-known contributors have built upon the foundation established by the first edition and provided the reader with a comprehensive introduction to the subject of public health informatics. 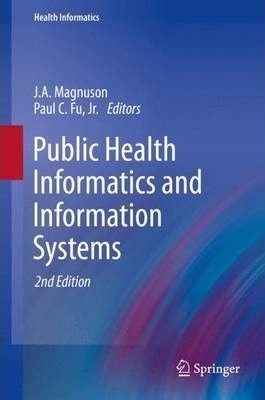 The breadth of material in Public Health Informatics and Information Systems, 2nd edition makes it suitable for both undergraduate and graduate coursework in public health informatics, enabling instructors to select chapters that best fit their students' needs. J.A. Magnuson is an informaticist with exceptional public health, teaching, research, and management skills. Diverse experience including academia (professor), state public health (health informatics architect), and private industry (Director of Research & Development). Dr. Paul C. Fu, Jr. is Director, Clinical Informatics, and Director, Pediatric General Pediatrics Inpatient Service at Harbor-UCLA Medical Center. He was previously Chief Medical Information Officer at the Los Angeles County Department of Health Services, one of the largest public health service delivery systems in the country. Dr. Fu also leads the Center for Biomedical and Public Health Informatics at the Los Angeles Biomedical Research Institute.